Fried Ham Steak with Red Eye Gravy, Thyme for Cooking easy main course. Clean, trim and slice mushrooms. Heat oil in nonstick skillet over medium high heat. When hot add paprika and sauté 1 minute. 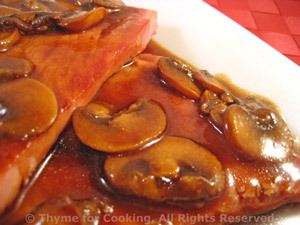 Move mushrooms to the side and add the ham slices. Brown lightly on both sides. Add coffee, sugar and bring to a boil. Remove ham to a small platter. Add cornstarch dissolved in water and stir until sauce is thick. Pour over ham and serve.